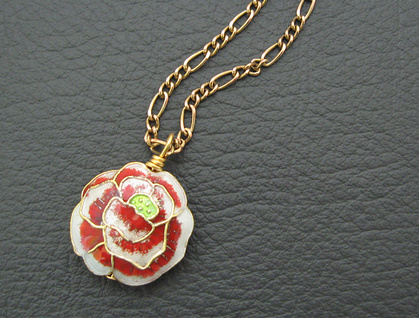 A single red rose, its petals edged with white, is suspended on an old, gold-coloured chain. 'One Red Rose' is a one-off design, never to be repeated. The rose is a beautiful, high-quality example of the cloisonné technique. Cloisonné is an ancient art whereby metal hollows or cavities, outlined by ridges or strands (sometimes twisted like ropes) of metal, are filled with coloured glass enamel. The result is shimmering colours on a metallic (often gold or silver) background. 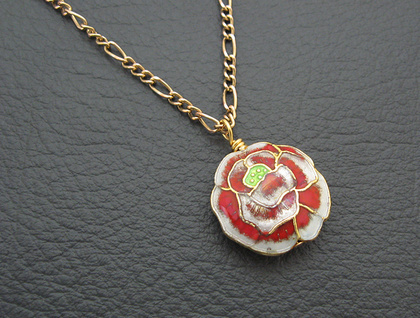 This dainty cloisonné rose is a rich scarlet in colour, with white-tinged petals and a light green centre, against a bright gold background. The design is almost identical on both sides: there are tiny variations, as is the nature of handmade cloisonné. 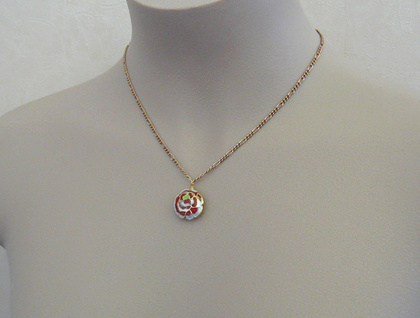 The pendant is shaped like a round cushion, and is hollow, making it lightweight and easy to wear. It is wire-wrapped on a gold-plated headpin, and moves easily on the chain. The chain is an old, figaro style chain which I have had for years. I cannot remember how old it is or from whence it originally came, so it may be vintage. I have polished it to bring up the highlights, and given it a new, more reliable clasp: a small toggle clasp, made of pewter, plated with gold, and antiqued to show up the details of its design. The necklace measures 46.4cm, including both parts of the toggle clasp. The rose pendant is 20mm across. 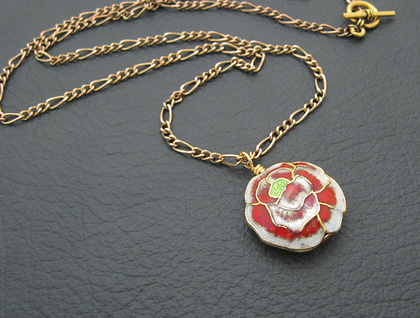 Unlike most Silverlight Jewellery pieces, 'One Red Rose' cannot be altered in length.